Amazon Best Selling Tactical Folding Knives – A reliable, well-made tactical folding knife is like a trusted friend. It’s always there for you when you need it, whether you have to defend yourself or just need it as a useful tool for camping, fishing and other everyday activities. The most worthwhile tactical folding knives are up to all of these tasks and other challenges. Choosing one seems difficult, which is why looking at Amazon best seller knives is such a great place to start. Each of these models offers the best in performance, durability and usability. You really can’t go wrong with any of them, but one of these knives may be better suited to your purposes than the others. The first model in our comparison is the TAC Force TF-705 Series Assisted Opening Tactical Folding Knife. One-handed opening is possible thanks to the spring assist, then a liner lock ensures that the blade stays open when you want it to. The handle is lightweight but sturdy aluminum, and the blade is stainless steel and features serration along half the blade. Other features of the knife include a screwdriver, bottle opener and glass breaker that is suitable for shattering car windows in an emergency. A pocket clip makes it easy to have this tool always at your side. 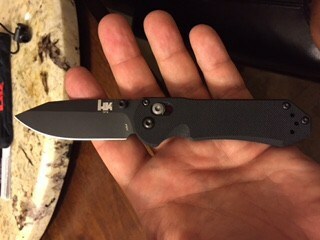 The second knife is Kershaw’s 1990X Brawler. Opening is activated by a push on the thumb stud or by pulling back on the flipper for extra flexibility. The Brawler’s blade is steel while the handle is glass-filled nylon, which is both lightweight and durable. With a straight-edge blade, this knife is easy to sharpen. The blade may be thin, but it also is powerful enough for tough tasks. The pocket clip may be moved to one of four positions. The Smith & Wesson Extreme Ops SWA24S rounds out our comparison. This model has a high-carbon steel blade and an aluminum handle. There is no spring-assisted opening feature, but it is still possible to open the knife with one hand thanks to the ambidextrous thumb knobs. A partially serrated blade appeals to users who want to cut through anything. The pocket clip makes it easy to keep this knife close to hand at all times. How Much Do These Tactical Knives Cost? The TAC Force knife sells for anywhere from eight to 11 dollars on Amazon, depending upon which color you choose. Kershaw’s offering sells for approximately low twenties while the Smith & Wesson tactical knife sells for around the sames as the TAC Force. The bottom line is that all of these tactical folding knives are affordably priced. You could easily buy two or three of any of them so that you can keep one in your vehicle, another with your fishing and camping supplies and a third to be carried on you at all times. Without a doubt, the TAC Force knife boasts more features than the other models. With its screwdriver, bottle opener and glass breaker, it’s somewhat closer to a true pocket knife or a multi-use tool than the other knives in our comparison. However, if you are only looking for a sharp blade, then any of the three knives that are described here could suit your purposes. With its lack of serration, the Kershaw is probably the easiest to sharpen, and that may appeal to you if you are a heavy user. What About the Opening Mechanism? The TAC Force and the Kershaw have the advantage here as there is no spring-assisted opening mechanism on the Smith & Wesson. Nonetheless, all of these can be opened with just one hand. This can be a distinct advantage over other knives, particularly in a high-stress situation. The more you practice with the opening mechanism, the faster you’ll be. Also, you’ll find that the movement becomes more natural with repeated use. A great deal of confusion persists regarding whether or not it is legal to possess these knives. This typically arises because of the one-handed opening mechanism that is a feature of all of these models. However, none of these knives is a true switchblade. A genuine switchblade opens automatically, while these knives only have mechanisms to assist with quicker, one-handed operation. Accordingly, it should be legal to own and use these knives in all 50 states. It may not hurt to review local ordinances and rules in certain buildings so as not to run afoul of other restrictions. The TAC Force knife has a stainless steel blade. This is good news as stainless steel resists corrosion and does a fair job of maintaining an edge. TAC Force does not disclose the precise stainless steel used in this model, but it’s safe to say that it is 440-type steel. This is an economical choice, which may translate to being more prone to rust and not holding an edge for an extended time. The Kershaw uses an upgraded 8Cr13MoV steel blade with black oxide coating. With the coating, the blade does not reflect light, which may be valuable for some users. This steel blade may be more corrosion resistant and offer improved edge retention over the TAC Force model. With the Smith & Wesson model, you get a 7Cr17 high-carbon steel blade. The company says that the blade is stainless, which is unusual for high-carbon steel, which tends to corrode more than true stainless steel. You just might find that the high carbon steel in this blade gives you superior edge retention and hardness. For even more tips and hints about choosing a folding tactical knife for yourself, check out the video. It provides an educational look about several considerations that you may want to weigh as you choose a folding tactical knife. For their affordability, functionality and durability any of these best-selling knives from Amazon are a great choice.